WASHINGTON -- President Donald Trump's lead lawyer in the special counsel's Russia investigation has resigned amid a shake-up of the president's team, an exit that removes the primary negotiator and legal strategist who had been molding Trump's defense. 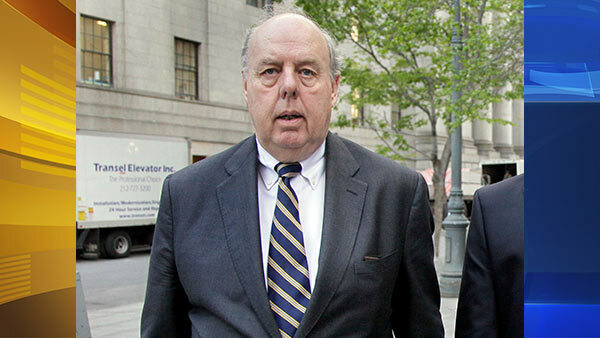 The departure of attorney John Dowd comes as the president has personally intensified his attacks on the special counsel and just days after the Trump legal team added a new lawyer, former U.S. attorney Joseph diGenova, who has alleged on television that FBI officials were involved in a "brazen plot" to exonerate Hillary Clinton in the email investigation and to "frame" Trump for nonexistent crimes. Dowd confirmed his decision in an email Thursday to The Associated Press, saying, "I love the President and wish him well." Dowd said he made the decision voluntarily and he denied reports that his departure had to do with Trump ignoring his legal advice. It already was a delicate time in special counsel Robert Mueller's investigation as Trump's attorneys, including Dowd, have been negotiating with Mueller over the scope and terms of an interview of the president. Trump has told reporters that he was eager to speak with Mueller, but Dowd has been far more apprehensive, and the lawyers have not publicly committed to making Trump available for questioning. Asked Thursday whether he still wants to speak with Mueller's team, Trump told reporters, "Yes, I would like to." Dowd's exit nearly a year into Mueller's investigation threatens to undo the cooperation between prosecutors and Trump's lawyers and may herald a stark shift in strategy as the probe reaches closer into the White House and the president's inner circle. Over the weekend, Dowd issued a statement calling for an end to special counsel's investigation. The White House and later Dowd had to clarify the statement, saying the president's legal team wasn't calling for Mueller to be fired. But Trump has upped his public attacks on Mueller. In a series of tweets since last week, the president has said that the probe never should have started, that it was based on "fraudulent activities," that it was a "WITCH HUNT" and that it is being led by "13 hardened Democrats, some big Crooked Hillary supporters." White House press secretary Sarah Huckabee Sanders said earlier this week the tweets were a reflection of Trump's frustration with the process of the investigation. She said the White House did not think firing Mueller would be "the most productive step forward." Another of Trump lawyers, Jay Sekulow, confirmed Dowd's resignation and praised his former colleague. "John Dowd is a friend and has been a valuable member of our legal team. We will continue our ongoing representation of the President and our cooperation with the Office of Special Counsel," Sekulow said. This is at least the second major reshuffling of Trump's legal team in the last year. Dowd had taken over the lead lawyer role last summer from New York attorney Marc Kasowitz, who has long been by Trump's side. Dowd is a veteran defense lawyer perhaps best known for producing a report for Major League Baseball on star player Pete Rose's gambling habits. He's also played a role in some of the defining legal quagmires of the last four decades - among them, the Iran-Contra affair, the Keating Five, the Enron collapse and a scandal over the firing of U.S. attorneys. As the investigation progressed, Dowd has touted the cooperation of the White House and Trump campaign with Mueller's investigation, calling it "the most transparent response in history." His work on behalf of Trump has previously raised eyebrows. In December, he took ownership of a controversial tweet from Trump that said former White House national security adviser Michael Flynn was dismissed months earlier for having lied to the FBI. The tweet appeared to confirm for the first time that the White House knew at the time of Flynn's firing that he had misled the FBI. That was important because fired FBI director James Comey has alleged that Trump, in a private Oval Office conversation, had encouraged him to end an investigation into Flynn. Amid media scrutiny of the tweet, Dowd claimed to have written it himself.